Castle Vardulon: Production Secrets Explained: Criminal Minds! 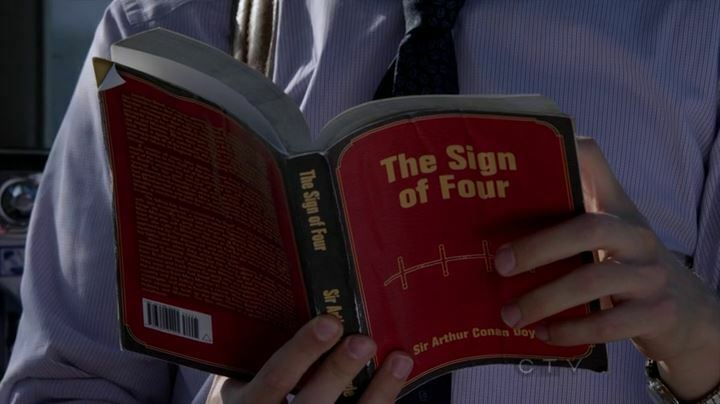 Now obviously that book makes no sense - with paper that size 'The Sign of Four' would be something along the lines of sixty pages long, rather than the 300 pages that edition seems to feature. So how does a mistake like this happen? To understand that, we have to go through the production steps! First, a line in a script will indicate that Reed is reading a book while waiting for a phone call to be returned. Now it's possible that the script specified 'Sherlock Holmes', or even this story, but let's say, for the sake of making this whole process easier to understand, they didn't. 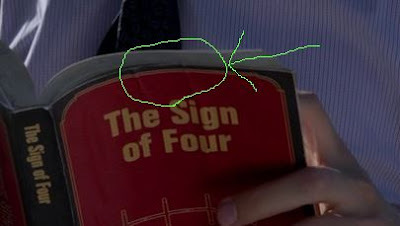 So the production staff has a request for a book for the actor to hold in the scene. The first question that arises is 'what book'? There are more constraints placed on this decision than you might think, but the first, and by far most important, is that the book be something which is copyright cleared - something that the show won't risk being sued over because it has created an association between the two properties. Ever wonder why so many fictional characters are so fond of Dickens? It's because he's been dead long enough that you have to worry about him or his publishers objecting to the reference. Huge numbers of people buy and read Stephen King novels, but if a character on a TV show carries around a specific novel, all sorts of questions get raised that producers and executives don't want to have to deal with - not just from King's publishers, either. If Stephen King were to currently have a show airing on another network - which happens quite often - higher-ups at the show's own network would take exception at giving free advertising to a competitor. So it's just simpler to use something which is copyright cleared. And even though the majority of things ever written are copyright cleared, Dickens is always used because it's an author that the audience can be counted on to at least have heard of. So, faced with the need to come up with something copyright-cleared, the production staff immediately goes to Doyle because the audience can be trusted to immediately associate Sherlock Holmes with the detective work in the series. But why dummy up such a crude prop when you could simply go out to a store and buy a Sherlock Holmes book for a paltry sum? It goes back, once again, to copyright. While the stories themselves aren't under copyright, the cover design and art - and sometimes fonts - used in new editions are. While there's every chance that a publisher would sign off on having their edition featured in a television show at no cost to either party, from the point of view of producers, checking with them is a job that they simply don't have time for. Any network television show is a machine that has to churn out a new episode every eight days - so literally any time the production might have to make a phone call and wait for an answer is a potential waste of time. Anything that can be done without asking for permission is always preferable, even if it looks a lot worse. 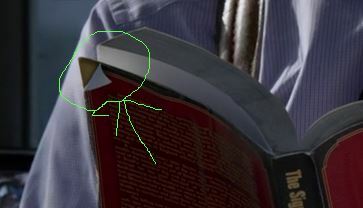 Which, naturally, brings me to why it looks a lot worse than a real book. Once 'Sherlock Holmes' has been decided on, a member of the production crew will download a PDF of open-source book cover templates, maybe tweak the colours a little, then add a title and author name - it's at this point that the big mistake is made, when the staff member - either because they didn't care or was pressured for time, neglected to add the words 'and other stories' below the title, explaining the size of the book. And more notably, the part of the back cover where there is no glue, and the paper has been folded down by being put in and taken out of a bag over and over again. This whole process, from seeing 'Reid holds a book' in the script to gluing the cover on and doing some final trims around the edges could have taken as little as 10 minutes - which is what separates television from movies. At the end of the day, while movie production value has to be 'good', television only ever has to be 'good enough' to trick the eye of an inattentive viewer for a second before the next plot point arises. This isn't an indictment of shoddy workmanship, either - I marvel at how quickly these shows are put together. 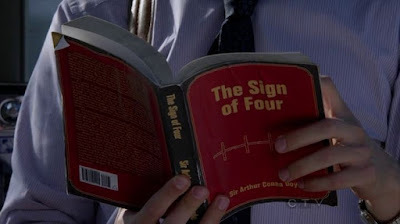 It's not just shows like Criminal Minds, either - Hannibal had one of these questionable books onscreen once, and it was even more egregious than this example. I'm just entertained at the way the advent of widescreen televisions and DVRs have given the opportunity to pause any moment of television and examine the seams. There's something charming about the fact that the fundamental nuts and bolts details of television haven't changed much as the presentation has moved forward leaps and bounds. Someone, I can't remember who, it might have been someone on the Leverage crew, proposed a whole business of just creating brands for movies and tv to use without worrying about copyright issues. I'd think the same thing would work for books, music, magazines etc... just have a whole collection of mock ups that were available to rent or purchase(for that one book the character never makes it through) for different productions.